Whirling disease is caused by a parasite (Myxobolus cerebralis) which is engulfed by a tubifex worm (intermediate host) then morphs into a free-floating life phase and attaches itself to a host fish (all species of trout and salmon family are susceptible). The parasite penetrates the head and spinal cartilage of the fingerling trough or salmon where it multiplies putting pressure on the organ of equilibrium. This causes the fish to swim erratically in circles. This prevents the fish from foraging for food and evading predators, resulting in death. The parasite is able to survive freezing temperatures. During the spore stage of the disease, it able to survive 20 to 30 years in a stream before finding an intermediate host. The overall biodiversity and balance of streams is affected by the loss of trout and salmon. Coldwater fisheries have been significantly impacted by this parasite. Not currently found in Nebraska. The parasite is native to Eurasia and is a common European parasite and was introduced into the United States in the late 1950s. The introduction was from an imported trout from Europe. The disease has spread throughout the United States and now established in 25 states including Wyoming, Colorado, Montana and New Mexico. Do not transport live fish from one body of water to another. 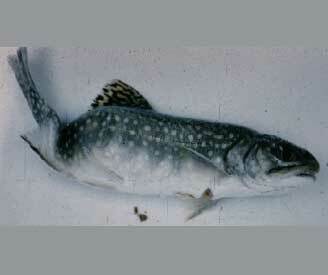 Do not use parts of salmon, trout or whitefish as bait. Download the Whirling Disease Brochure. Download the Whirling Life Cycle Info Sheet (for kids). Dr. Thomas L. Wellborn, Jr.